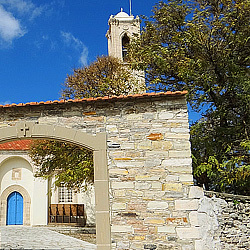 The magnificent Lefkara Church is dedicated to the Holy Cross and dates back to the 14th century. 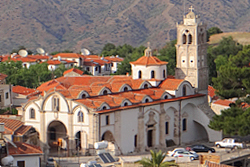 According to the byzantinologist Athanasios Papageorgiou the eastern part of the Church dates back to the 14th century, namely after considering rescued frescoes behind the church’s iconostasis. This date is also confirmed by the metrical “Olivianos’ inscription”, which appears at the bottom of the Lefkara Golden Cross. 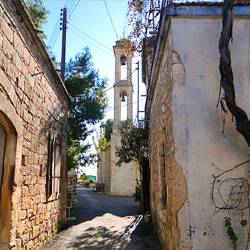 There is written evidence that Olivianos was a Lefkara Bishop in 1307 during the occupation period by the Franks. This fact is also confirmed undeniably by the founder’s note on a manuscript dating back to the 14th century, which is kept in the Church’s safe. At the end of this manuscript, which is a precious Evangeliary it is noted that it was written in 1345/46 and that the monk Gabriel who was the abbot and the founder of the “Holy and Life-giver Revealed Cross” monastery paid all the expenses. In 1740 the church was restored and the wooden sculptured iconostasis was then made by the Rhodian sculptor Hadjikyriacos who was called in by the church-warden Lourentzos to this end. An inscription at the bottom of the icon of the Deposition of Christ gives evidence that in 1761 the iconostasis was gold-plated and the then Kition Bishop Makarios attended the ceremony on this occasion. 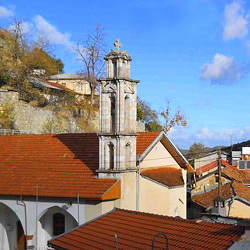 In 1857 the magnificent bell-tower of the Church, the bells of which were donated by devout Christian people from Lefkara living abroad, was constructed. In 1867 important works were carried out in the church and it was, therefore, expanded in order to have a greater congregation capacity. In 1909 common repair works in the church were deemed necessary and then the entrance was constructed as it appears today. The south door was also built. In 1953 the dome was covered with paintings. 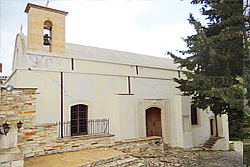 The style of the eastern part of the church is cruciform with a cupola, while the style of its more recent part is Cypriot dating back to the 19th century. Furthermore, there are six internal pillars ranged in two rows per three pillars. The iconostasis has an invisible cavity. It is the crypt where the big wooden Cross is kept, which the church is dedicated to. According to tradition, a piece of the Cross of the Lord is contained in the centre of this cross. The Cross is entirely thin silver sheet coated. Fourteen embossed depictions from the Lord’s life, angels and the Is Apostles Constantine and Helena can be seen on the front main facet. The representation of the crucifixion is overlooking in the centre and is covered by the two side doors, which Theotokos (the Mother of God) and Ioannis (John) are represented on. This representation is surrounded by four angels. Constantine the Great, the “Betrayal of Jesus”, “Golgotha” and Saint Helena are illustrated in a row horizontally on the Cross. “The Throne of the Second Coming” and the “Resurrection of Jesus” as well as the representation of the “Deposition” and the “Burial of Jesus” are illustrated in a row vertically on the Cross from top to bottom. Olivianos’ picture with the relevant metrical inscription is illustrated to the far bottom level. According to tradition, a piece of the Holy and Life-giver Cross of the Lord is contained in the Cross. 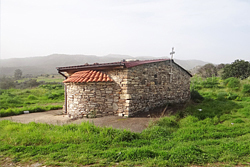 North of Lefkara, on the road leading to the village of Kornos and after a 20’ walk one encounters the Byzantine chapel of Panagia Livadiotissa. The chapel is an excellent sample of the Byzantine architecture of the 12th century. From this spot one can enjoy the panoramic view of the river Sirkatis valley with the impressive rock of Kourvellos in the middle. 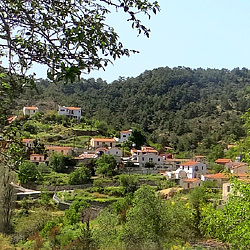 In the area there are a few perennial olive trees, the so called ‘frangoelies’ due to their existence since the francocracy. 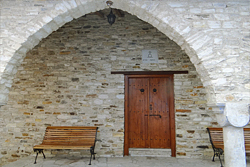 This chapel is part of the hotel complex “LEFKARAMA”and is probably the oldest of the Lefkara chapels, originating back in 902 A.D. The interior features important pictures of the 19th and 20thcentury. 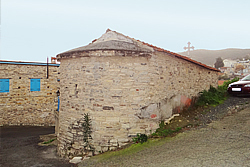 Saint Andronikos chapel lies in the historic core of the Lefkara settlement. 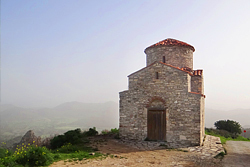 According to Glafkos Papadouris, an architect, the chapel was the centre of the medieval Lefkara. The saint’s memoire is on the 9th October. This chapel lies near the road to Vavatsinia. 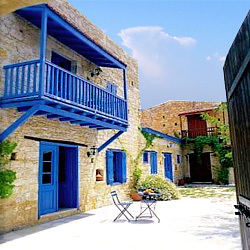 It is a sample of the Byzantine architecture. 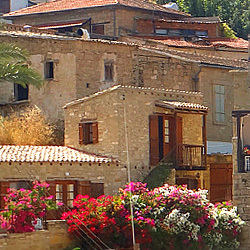 It is probably one of the many chapels that were built throughout the island during the 12th century. 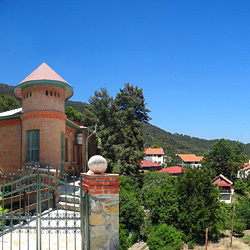 It was renovated in 1984 with an expense by the Ecclesiastical Committee and donations. These two chapels are dedicated to Anargyri saints Kosmas and Damianos and to saint Neophytos. The bigger one is situated at the village’s entrance and has the size of a normal church. 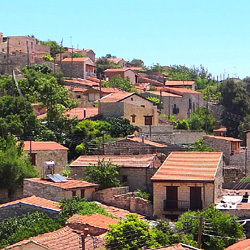 It was restored from a ruined state in the 50s with the financial help of residents of Lefkara. The other chapel is much smaller and is situated close to the first one. 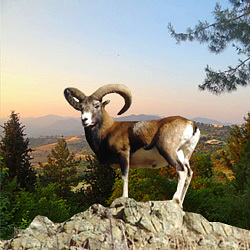 Anargyri saints are considered to be healers of physical and psychological wounds. 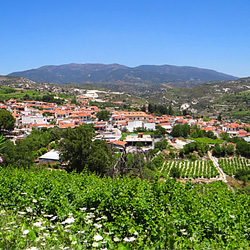 Saint Neophytos, an important image of literature, lived during the 12th century and came from Lefkara. 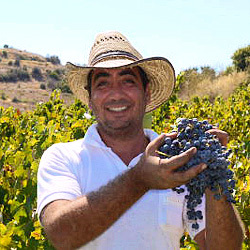 Saint Neophytos is honored islandwide on the 28th September and on the 24thJanuary. 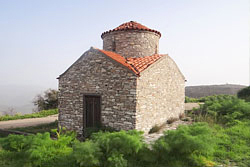 This chapel is probably the temple of a small settlement named ‘Ayios Georgios’. 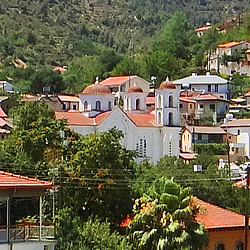 The settlement belonged, during Francocracy, to the Lefkara feud. According to tradition, the name ‘Syrkatis’ comes from the bloodshed that took place during the early years of the rule by the Turks. 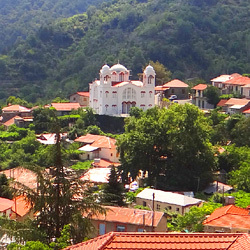 The modern chapel of saint Xenophon lies below the main churh of Holy Cross. 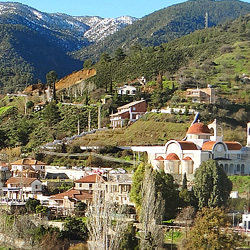 Saint Xenophon is celebrated annually on the 26thJanuary. Saint Xenophon is very popular due to the naming ‘Xorinos’, which means he who exorcises evil. In the chapel there is an icon that depicts the saint with his wife and children.